After losing their undefeated away record last week, Trowbridge showed that they possessed bouncebackability with a convincing home win at Purton's expense. Captain, Ricky Trott returned in midfield and Michael Greaves made a promising first team debut at the back. Trowbridge went in front with only 4 minutes on the clock. Jack Heard slotting the ball home having run onto a Gavin Eyre through ball. An even better move nearly produced a goal on 9 minutes. Jack Heard back healed the ball into the path of Adam Nunn but Purton managed to clear. The visitors then had their best spell of the match as they forced a couple of corners and free kicks. Simon Pugh was in on goal just after the half-hour mark and would have shot at goal but for a well timed tackle by Michael Greaves. In the 38th minute Purton found themselves down to ten men following a sending off and Trowbridge took control. Jack Heard touched the ball to Dave Percival just inside the Purton half and the league's leading goal scorer raced through to make it 2-0 with 39 minutes gone. Just before half time, Percival struck again running onto a ball, which bounced up nicely for him to head over the line just in front of the goalkeeper. 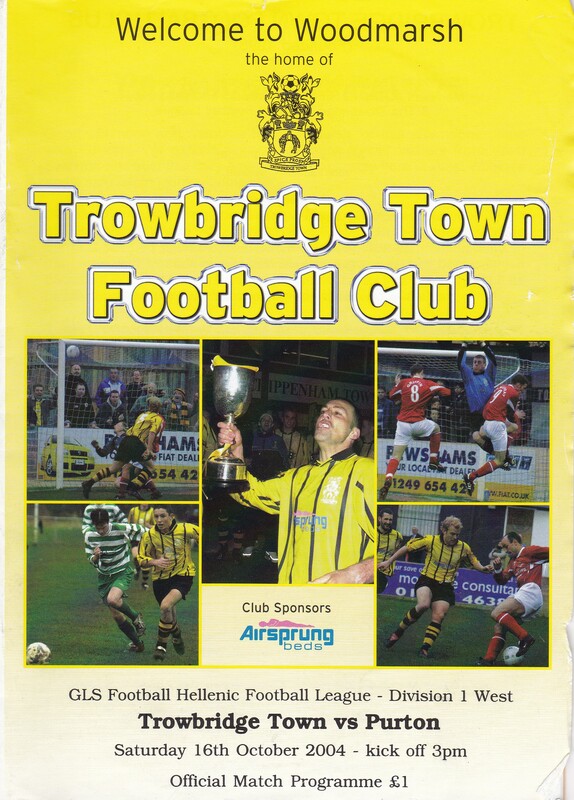 The second half was mostly one-way traffic as Purton pushed up looking for goals allowing Trowbridge to use their pace up front. Adam Nunn shot straight at the 'keeper on 53 minutes and 12 minutes later a corner taken by Gavin Eyre dropped between a crowd of players where Matt Cooper was on hand to score from close range. In the 76th minute, Martin Little made it five, heading home a cross form Adam Nunn. Dave Percival wrapped up the scoring, completing his hat trick with 11 minutes of the match remaining. A typically confident finish from just inside the area having run onto another good through ball from midfield.